Eric and I travelled to Australia for a month, in august/september of 2002. We flew in to Sydney, and drove to Darwin in a rented campervan. On the way up the east coast, we made detours to the Blue Mountains, Hunter Valley, and Fraser Island. After a three-day diving trip at the south end of the Great Barrier Reef, we drove through the Outback of Queensland and the Northern Territory. In the Top End, we visited Litchfield and Kakadu Parks, before flying out from Darwin to Singapore. We softened the blow of returning home with a three-day stopover in Singapore, and then returned to Amsterdam. Click on one of the links above (or in the "map" at the top of the page) for more details on any particular area we visited. The map below shows our route through Australia. Transportation in Australia: about the rental campervan, and about driving it from Sydney to Darwin. whether there is an extra charge if you take the campervan to the Northern Territory or Western Australia. About driving the campervan from Sydney to Darwin. Our total trip was close to 6000 km (3750 miles). All of our long-distance driving was along the country's major highways: the Pacific Highway up the east coast, Capricorn Highway from Rockhampton to Mount Isa, Barkly Highway to the west of Mount Isa, and Stuart Highway up to Darwin. The Pacific Hwy and the Highways in the Northern Territory were in good shape, and Capricorn was pretty good, but the roads from Mt. Isa to the Northern Territory border were very bad. Very good means two lanes (one per direction) and sometimes a third (overtaking) lane. Very bad means one narrow, ragged lane, that the road trains barrel right down the middle of. They don't stop, or even move aside, for campervans, and you certainly don't want to challenge them, which means you have to deflect into the rough gravel next to the asphalt, and come to a grinding stop. Visit my Outback page for a picture of the highway at (more or less) its worst. When the roads were good, driving in outback Queensland and the Northern Territory was very easy as there was little traffic. We could stop in the middle of the highway to take off a sweater or have a drink, and I even amused myself (kept myself awake) by driving on the right side of the highway once or twice (you normally drive on the left in Australia). I absolutely loved the way in which all drivers in the outback greet oncoming traffic with a wave of the hand, and made sure I always waved back. "Hey, look honey, a car!" Road trains are a small problem. I noticed a lot of people pulling half off the road when a road train came the other way, and thought this was a little overdone until I read about several accidents in which campervans were swept off the road by these monster trucks, killing all inside. They have a strong wake, so you'd better hold on to your steering wheel. The road trains are also largely responsible for the enormous numbers of dead kangaroos we saw along the highways in the outback. Hundreds and hundreds of them, at a certain point I counted one every one hundred meters. Apparently, they came to the highway looking for water, because of the drought, and there's no way the road trains can brake in time to stop from hitting them. That was a very sad sight to see. Driving took more time than we'd estimated beforehand, as driving was a lot slower than it is in Europe. The campervan was not particularly fast - it made 110 km/hr on flat areas, and 60 or so uphill. It turned out to be surprisingly sensitive to wind (and there was a pretty gusty wind a lot of the time). On days when we had a head wind, we were happy to make 100, while we pushed up to 130 when the wind came from the back. The poor roads in outback Queensland slowed us further, as did slow road trains that we didn't dare overtake. All in all, this means that we only drove 500 to 600 km in a day, and close to 700 on one particularly long day. It took us four days of serious driving to get from Rockhampton to Litchfield (a few hours south of Darwin). Eric and I have this weird thing that we really wanted to see that there was nothing to see, in the outback, so we actually enjoyed driving through the desert for four days. I, for one, wanted to see this incredible emptiness for myself, and that is simply not something you can do in half a day. It takes a few days to realize how empty "empty" really is. However, we were happy when we got to Litchfield: four days was quite enough. If you don't have the patience for four days of desert driving (and I think many people might not), you might want to reconsider and fly to Darwin. On the way in, we flew from Amsterdam to Sydney. Actually, it was a little more complicated than that, perhaps because we booked only a few weeks before we went: we flew from Amsterdam to London Heathrow with British Airways, then from London to Sydney with Qantas, with a 1-hour stop in Singapore. The flight took about 24 hours, but with travelling to and from airports, waiting times, and the time difference of eight hours, it took pretty much from saturday morning to sunday evening. On the return trip, we first had a four-hour Qantas flight from Darwin to Singapore, followed by a Quantas flight from Singapore to Frankfurt three days later. Finally, we flew from Frankfurt to Amsterdam with KLM. The entire flight cost us 1045 euro per person. We only booked about 3 weeks before we went, but had to be flexible in our destinations: flying in to Darwin, and back from Sydney, was no longer possible. We spent most nights in the campervan, in caravan parks. They usually cost us somewhere between 14 and 22 Australian dollars, for a full hookup spot. There was a brochure with hundreds of caravan parks in our campervan, and we had no problem at all finding them. We never made a reservation, and never ran into full caravan parks. However, we heard that the caravan parks along the east coast can get busy in high season. In Outback Queensland we also tried some "dry camping," which was - naturally - free. We found that many older Australian tourists, often retired and on very long trips, did this. Try finding a picnic area just outside of a town, and chances are you'll find a couple of retirees camping there. You'll even have toilets, but no electricity and probably no running water. I got the impression that this is quite safe. We stayed at Capitol Square Hotel in Sydney (booked via the internet), which was very good. In Singapore we stayed at the Concorde Hotel, which was very luxurious. We also took a 2-day trip to Fraser Island, where we stayed at Eurong Beach Resort, which was good. During a 3-day diving trip, we stayed on a boat. I really missed our cosy campervan during these two trips! We arrived in Sydney on august 25th, and left Darwin on september 21st, so we were there in early spring. I'd say these times are pretty good. It was a little chilly in the Blue Mountains, close to Sydney, and it took us a few days to adjust to the heat in the Top End. Perhaps reversing the trip - driving from Darwin down to Sydney - would have been better, but I'm not sure if a few weeks makes all that much difference. We had a few rain showers in Sydney, and one in the Top End, and that's all the rain we saw. There's another important consideration to make: you can't enter the ocean along most of the Queensland and Northern Territory coasts because of the box jellyfish, in summer (roughly from november - may). Another thing to keep in mind is the "wet," which can result in an awful lot of rain in the north, in the summer months (which is from december to february, in the southern hemisphere). Finally, we liked travelling in a relatively calm time of year, not exactly the height of the tourist season. Caravan parks always had room. Often we reduced the average age at a caravan park by a few decades, sometimes it seemed like there was hardly anyone under fifty. If you're looking for a party at a caravan park, it's obviously not the thing, but if you want the caravan park for sleep, it's great. The "grey brigade" will probably not keep you awake at night. For overall Australia, I'd suggest using either the Lonely Planet or Rough Guide, they're both very good. We brought the "Islands" one as we were particularly interested in diving. "Down Under" by Bill Bryson. Bryson describes his various trips around Australia. Hilarious, excellent! "We of the Never Never" & "The Little Black Princess" by Mrs. Aeneas Gunn. The author lived in the Northern Territory Outback in 1902 and describes life in the Outback, and with the aborigines. The books are from 1908 and 1905, and are Australian "classics." 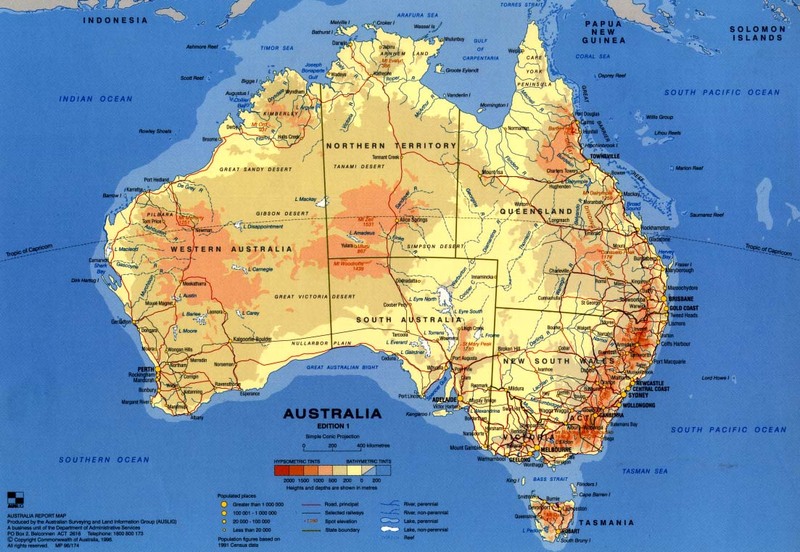 Pick up a decent map of Australia right here. More maps, as well as geological info, are found here.